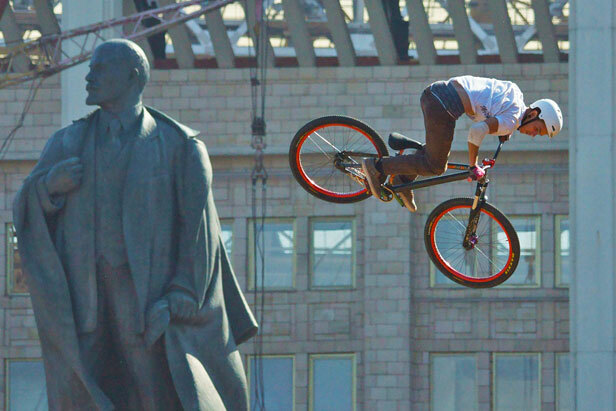 The Moscow City Games (MCG), a huge event dedicated to extreme sports, took place at Luzhniki Stadium in Moscow. The masters of dirt bikes, BMX, freestyle motorcycling, workout, parcours, and trick riding put their talents on display. For one day, the grounds at Moscow's biggest stadium turned into a center for active recreation and extreme culture. MCG included more than 50 arenas outdoors. Everyone here could find the activity they enjoyed most. Graffiti artists spent several hours creating street paintings. What's more, not a single building, wall, or fence was damaged in the process. Not far from them, the best break dance teams, beat boxers, and wrestlers showed what they're made of. At the same time, the water near Luzhniki was the spot of Russia's first regatta for solar-powered boats. These "solar" boats are the cleanest form of water transportation and provide a great alternative to motor boats.